A serious snippet of history here. It captures the era in which the Roman Empire of the West was abandoned to the Germanic tribes who essentially took over control and became the effective aristocracy as time went on. Thus began a long span of military evolution based on the mounted warrior and his attendants that only truly ended with modernity. Even with firearms, cavalry provide maneuver, allowing infantry to face off. The Vandal King Gaiseric, also spelled as Geiseric or Genseric, was one of the most remarkable figures of his era. During his nearly 50 years of rule, he raised a relatively insignificant Germanic tribe to the status of a major Mediterranean power - which after he died, entered a swift decline and eventual collapse. Gaiseric, whose actual name Gaisureiks means "spear-king", was an illegitimate son of King Godigisel; he is assumed to have been born near Lake Balaton (now in Hungary) around the year 389. (see note 1, bottom of page) Sources of that time say that Gaiseric was Godigisel's son by one of his slave-girls, but that the father treated him as almost the equal of his legitimate son Gunderic. As a young man, Gaiseric fought in wars against the Romans and Franks; we can presume he participated in a bloody war with the Franks in 406 and the subsequent breaching of the Roman Empire's Rhine frontier on 31 December 406. After his father's death in battle in 406, Gaiseric was the second most powerful man among the Vandals, after the new king, his half-brother Gunderic. He seems to have held no ill will toward his brother (existing Roman accounts that say he became King by murdering Gunderic are probably propaganda; the same sources often refer to Gaiseric as the Antichrist) and spent most of his time constructing a Vandal fleet, something that they had not possessed in centuries. At the time, the Vandals resided in the Andalusia region of modern Spain (then known as Vandalusia or Land of the Vandals). After Gunderic's death in 428, almost certainly in a battle with the powerful Visigoths in Spain, the 39-year-old Gaiseric was elected as the new King. Brilliant and well-versed in the military arts, he immediately began to seek ways of increasing the power and wealth of his people. The Vandals had suffered greatly from attacks from the Visigoths, and not long after taking power, Gaiseric decided to leave Spain to this rival Germanic tribe. Taking advantage of a dispute between Boniface, Roman governor of North Africa, and the Roman government, Gaiseric ferried all 80,000 of his people across to Africa in 429. Once there, he won many battles over the weak and divided Roman defenders and quickly overran the territory now comprising modern Morocco and northern Algeria. His Vandal army laid siege to the city of Hippo Regius (modern Annaba, Algeria) in 430. This siege is famous to history because St. Augustine was serving as Hippo's bishop, and died during the siege. At one point, a Roman army dispatched from Constantinople relived the city and actually lifted the siege. But the Vandals responded with a counterattack that captured Hippo late in 431 and ended 14 months of bitter fighting. The next year, Roman Emperor Valentinian III recognized Gaiseric as king of the lands he and his men had conquered, and Hippo became the new Vandal capital. In 439, after casting a covetous eye on the great city of Carthage for a decade, he took the city, apparently without any fighting. Accounts of the seizure say that Gaiseric paid the gate-handlers to open the city walls late at night, so he could slip hundreds of his soldiers inside the city and seize key points throughout town in the dead of night. That morning, the Vandals threw open all the gates and the city surrendered forthwith. Because the Romans were caught unaware, Gaiseric also captured a large part of the western Roman navy docked in the port of Carthage. When these ships, most of whose captains simply shifted allegiance, were added to his own burgeoning fleet, the Kingdom of the Vandals threatened the Empire for mastery of the Mediterranean Sea. Carthage, meanwhile, became the new Vandal capital and an enemy of Rome for the first time since the Punic Wars. With the help of their fleet, the Vandals soon subdued Sicily, Sardinia, Corsica and the Balearic Islands. Ironically, Gaiseric had now restored the ancient Carthaginian empire in the exact boundaries it had held prior to the First Punic War. By 442 the Romans had no choice but to acknowledge the Vandals' new conquests. They furthermore recognized the Vandal kingdom as an independent country rather than one officially subsidiary to the Roman rule. The area in Algeria that had remained for the larger part independent of the Vandals turned from a Roman province into an ally, although later, even it would come under Gaiseric's dominion. For the next 30 years, Gaiseric and his soldiers sailed up and down the Mediterranean, living as pirates and raiders. One legend has it that Gaiseric was unable to mount a horse because of a fall he'd taken as a young man; so he assuaged his desire for military glory on the sea. He is said to have sometimes taken command of an expedition personally, trusting to fate for a target to attack, with the comment "Let God take us to those He is angry with..."
For a man of such achievements, Gaiseric seems to have in fact been rather humble in boasting of them. In fact, he did not claim any title among his own people other than as their war chief until the fall of Carthage on 19 October 439. It was only then that he chose to assume the title of reiks (Latin rex), or King, although he had been the undisputed ruler of the Vandals and the Western Alans for 11 years. Because of his illegitimate birth, it is likely that Gaiseric was reluctant to officially claim the ultimate power until he had won so many victories that his authority was unchallenged. Another paradox of his life is how he was regarded by the Romans. Most enemies of Rome, even ones whose victories were as damaging as Arminius', earned at least a grudging respect from Rome. But Gaiseric, who won more battles against Roman arms than any other man in history, was never well-regarded by them. As mentioned earlier, the Romans for decades disseminated propaganda accusing Gaiseric of murdering his brother to reach the throne (which is almost certainly untrue) and that he was the Antichrist. And most Roman authorities refused to treat with Gaiseric as a rex until very late in his career (Gaiseric tended to respond to such snubs with the cold steel of his soldiers). When an envoy of the Emperor Zeno came to negotiate for peace with Gaiseric in 475, one of Gaiseric's terms was recognition of himself and his successors as Rex Wandalorum et Alanorum. On the other hand, Gaiseric was highly respected by other "barbarian" races of his time. The Berber tribes of north Africa had an almost superstitious regard for him, mainly due to his ability to constantly defeat the Romans. Even the stronger Berber kings, who might have maintained their independence, chose to support Gaiseric instead. The few who didn't often saw their own subjects switch allegiances. Gaiseric had off-and-on alliances with the Roman generalissimos Aetius, Aspar and Ricimer, and a formal alliance with Attila the Hun. 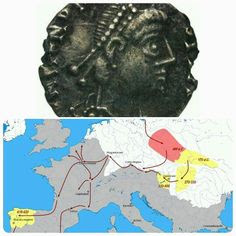 In fact, Gaiseric may have helped persuade Attila to launch his famous attacks on Gaul and Italy from 451-53; attacks which made the west even more susceptible to the Vandals. One of the major reasons for the Vandals' rapid decline after Gaiseric's death was that no one could command the respect that he had; the Berbers were more inclined to fight than submit, and without a capable leader, the Vandals were no threat to the Goths or Romans. Gaiseric, like most of the Vandal elite class, adhered to Arianism, a branch of the Christian religion that rejects the doctrine of the Holy Trinity and considers Jesus Christ a separate being from God. In fact, the Vandals even diverged from the Arianism of the Goths. In Vandal Arianism, many of the practices of the old Germanic pagan religion were retained, with God and Jesus taking on many of the attributes of Odin and Thor. Gaiseric was, by all accounts, an almost fanatical Arian who insisted that anyone in his government--Vandal or Roman--adhere to the Vandals' unusual form of Christianity. At times, he even persecuted the Catholics in his kingdom, although this was more a matter of politics than anything. The Romans were Catholics and took a strong interest in supporting their fellow Catholics in the lands that Gaiseric had conquered. On many occasions, Gaiseric used their status as a bargaining chip to get concessions in negotiations with the Romans. One serious error made by Gaiseric concerned a law he passed regarding the succession to the Vandal kingship. Prior to their arrival in Africa, Vandal kings were elected according to the ancient Germanic custom. The most worthy man, usually from the nobility, was elected by an open vote of the soldiers (in practice, this meant the most worthy member of the royal family that Gaiseric was a part of). However, Gaiseric seems to have been influenced heavily by Roman ways as he aged. He eventually decreed that in the future, the senior member of his family would always succeed to the throne, regardless of merit. Sadly, this resulted in Gaiseric being succeeded by his cruel and incompetent firstborn son Huneric, instead of one of his other, more capable sons, or possibly his very able grandson Gunthamund (see note 3, bottom of page). The economy of the Vandal state thrived under Gaiseric, in large part due to the largesse brought in by the pirate ships. Even though the Vandals maintained a large standing army filled with Berber mercenaries and a vast navy, their success at piracy (and in exorbitantly taxing the Catholic Church) was enough to maintain the force at a high level and still leave plenty for the royal family and its nobility. Gaiseric allowed essentially free trade through the ports of Carthage, Hippo and Lepcis Magna, and a strong pottery industry was allowed to continue functioning under his rule. By the middle of the fifth century, Gaiseric was approaching 60 years old--a very old age for a man of that time--and had already accomplished as much as any German in centuries. Little did anyone know that he would like almost 30 more years and win even greater victories. Hannibal Redux--Carthage takes Rome at last! In 455, Roman emperor Valentinian III was murdered. The person who ordered his murder, Petronius Maximus, usurped the throne. Gaiseric was of the opinion that these acts voided his 442 peace treaty with Valentinian, and set sail for Rome, which was now hopelessly undefended. Earlier in 455, the great Roman general Aetius had been murdered by Valentinian, and as a result, Rome had no army to defend against the Vandals. Also, as Gaiseric knew, Rome could count on no help from the east, where Marcian had ruled since 450. On May 31, Gaiseric landed at Ostia with a force of 5,000 men of many nations--Vandal warriors, Moorish horsemen, Alans and even former Roman subjects--and marched on Rome itself. The trick was nearly on Gaiseric, however. A famine had struck Latium that spring and there was nothing for his men to eat in the countryside. Very quickly, his men started to go hungry. Gaiseric would have to either take Rome quickly and get at the food there, or else return to Carthage with a great loss of prestige. His weapons of choice were bluff and bluster. Gaiseric threatened to attack and destroy Rome. Whether his army could have breached the formidable walls or not is problematic, but Pope Leo I chose not to risk that it might. (see note 4, bottom of page) He personally met with Gaiseric and implored him not to destroy the ancient city or murder its inhabitants if it surrendered peacefully. Gaiseric agreed and the gates of Rome were thrown open to him and his men. Although history remembers the Vandal sack of Rome as extremely brutal (and their act made the word 'vandalism' a term for any group of wantonly destructive people), in actuality Gaiseric honored his pledge not to make war on the people of Rome. The Vandals did not do much destruction (or even any notable destruction) in the city; they did however take gold, silver and many other things of value back to Carthage. He also took with him Eudoxia and her daughters, including Eudocia, who married Gaiseric's son Huneric after arriving in Carthage. Many important people were taken hostage and later ransomed to the Imperial court in Constantinople. Flush with victory, Gaiseric followed up his raid on Rome with a strict blockade of Italy, which was, as we have seen, already starving. Presumably, he hoped to force the western Empire into a humiliating peace agreement which would make the Vandals even more powerful. However, in 456, the new Roman generalissimo Ricimer defeated the Vandals at sea and compelled them to lift the blockade. Ricimer then won a land battle at Agrigentum in Sicily and regained the eastern half of that island for Rome. Gaiseric, always astute politically, now turned Ricimer into an ally and the two men tried to foist their own candidate for the emperorship, a man named Anicius Olybrius, onto the throne. The emperor in Constantinople didn't agree to this, however. There was another attempt by the western empire to regain control of Africa in 461. This time, it was Majorian, Ricimer's hand-picked puppet emperor after Olybrius was rejected, who planned to attack Gaiseric's realm. Ignoring the wishes of his king-maker Ricimer, who had no wish to topple Gaiseric, Majorian made a deal with the Visigoths and assembled a massive fleet at Valentia Edetanorum (modern Valencia, Spain), which was then under Visigothic rule. However, someone (probably Ricimer) informed Gaiseric about Majorian's plans beforehand. This was a serious threat to Gaiseric, not only because of the size of the Roman fleet but because of the possibility of support from the Visigoths, who were unfriendly with the Vandals when the two peoples shared Spain. They were even more unfriendly in 461 because Vandal pirates attacked them constantly, and because Gaiseric's oldest son Huneric had recently mutilated a Visigothic princess' nose and ears after divorcing her. It was time for some more Vandal "diplomacy" of the type seen in Carthage. Gaiseric paid off agents in Spain, who helped him pull off a surprise attack and destroy Majorian's Roman fleet in April 461. Ricimer used this as an excuse to bump off Majorian, who had already won smaller victories over the Vandals earlier in his reign. So Gaiseric continued to reign supreme unopposed by the Romans. Ricimer continued to dominate the western empire. He had no interest other than remaining in power and was willing to collaborate even with Gaiseric to stay there. In fact, the Roman strongman at one point ruled the west for two and a half years with no emperor! In 468, Gaiseric's kingdom was the target of the last concerted effort by the two halves of the Roman Empire. They wished to subdue the Vandals and end their pirate raids. A year earlier, a rogue Vandal captain had raided territory in Greece, a Roman province under the authority of the eastern (Byzantine) Roman Emperor Leo I. Gaiseric had, since the reign of Marcian, an informal agreement with the east not to raid its territory in exchange for no Byzantine attacks on Vandal territory. Gaiseric had not ordered the attacks and probably would have made reparation to keep the peace, but Leo was anxious for a fight anyway. (see note 6, end of page) He believed bringing the Vandals to heel and forcing them to submit to Rome would save the tottering western Roman Empire. He declared war on Gaiseric and forced Ricimer, still the western Roman generalissimo, to do the same by installing a puppet Emperor in the western capital of Ravenna. The ensuing campaign, which ranks among the greatest victories ever won against Roman arms, took the form of a land-and-sea assault from several directions. Leo funded the attack, paying out 65,000 pounds of gold and 700 pounds of silver to equip over 1,100 ships and sign up 100,000 soldiers and sailors. This looked like an armada even the great Gaiseric had no chance against. But bad decisions, one man's bitterness and Gaiseric's trickery would save the day in the end. Leo was persuaded by his wife and Aspar, his leading general, into putting his brother-in-law Basiliscus in charge of the sea forces which would sail from the east against Carthage. This was the first mistake, as Basiliscus was both incompetent and a traitor (he briefly and illegally seized the throne after Leo died). Aspar may have had ulterior motives as well; he was an Alan and a an old ally of Gaiseric, who was of course King of the western branch of the Alans as well as the Vandals. In the meantime, the western general Marcellinus had seized Corsica and Sardinia from the Vandals, defeating a Vandal squadron and 100 of their galleys. Much of his force then sailed toward Sicily to join forces with Basiliscus. The remainder of the western force proceeded to Hippo Regius, blockading its port. This part of the attack was a success, except that Ricimer was angry that he had been forced to accept Leo's choice for emperor and then passed over for command of the western fleet. Soon, he began clandestine negotiations with Gaiseric. Meanwhile, General Heracleius of the eastern army obtained auxiliaries in Egypt and then sailed for Tripoli where he would disembark and march by land to Carthage. Soon Heracleius moved to within 25 miles of the city, taking Theveste (Tebessa, Algeria) and Basiliscus defeated the Vandals in a great battle off Sicily, sinking 340 of the 500 galleys sent out by the Vandals. It appeared as though Gaiseric would have to accept what would be harsh terms of peace. Enter Basiliscus. Instead of sailing directly for Carthage and taking the city through its port (it was heavily walled and would have been impossible to take only by land assault), he anchored his powerful fleet off Promontorium Mercurii (Cape Bon) about 45 miles away. Gaiseric sent him a message calling for a five-day truce, presumably so he could negotiate peace. The gate at the town of Bab-el-Bahr in modern Tunisia, which was built by the Romans in the third century AD. It was here that King Gaiseric is said to have viewed the climactic battle of Promontorium Mercurii in 468. It still stands today and is a popular tourist attraction. Basiliscus granted it, probably after receiving a bribe from the Vandal king's envoys. Gaiseric spent the five days preparing his old war galleys, filling them with brushwood and pots of oil. On the fifth day they were ready, waiting for dark to come. When the wind rose and the moon was obscured by cloud, the old galleys were towed out. Against the black sky, the Vandals reached the Cape Bon anchorage and started to fire the galleys. Roman guards observed fire darting to and from ships. The alarm was sounded too late. The fire galleys sailed into the pack of imperial ships which was too crowded, leaving no room for ships to maneuver. The flagship where Basiliscus stayed at was well away from danger (something which added to the suspicion against him). The wind drove the fire ships into the Roman fleet, throwing it into confusion. The noise of the wind and the crackling flames was mingled with the cries of the soldiers and sailors as they shouted commands to one another, using long poles to push off the fire galleys as well as each other's galleys. The Vandal fleet was behind the advancing fire galleys. They rammed the imperial galleys and sank them. There were some brave Romans in this struggle, including John, who was a general under Basiliscus. When his ship was surrounded by the Vandals and was being boarded, he stood on the deck and, turning from side to side, killed heaps of the enemy. Finally, once his ship was captured, he assured that much of the valuable Roman equipment had been thrown into the sea. Genzon (Gento), the third son of Gaiseric, boarded John's ship. He offered a promise of safety, but John refused, saying "A Roman does not fall into the hands of dogs!" He threw himself into the sea wearing his armor. The galleys of the Roman fleet burned throughout the night. The ones that didn't burn were attacked and thrashed by the Vandal fleet. What remained of Emperor Leo's mighty host withdrew to Sicily the next day. Cut off deep in enemy territory with no communications and no way to cut off Carthage's sea routes in a siege of that city, Heracleius beat a hasty retreat to the east, returning to Egypt. The Vandals, who had been handled roughly by this powerful army during its advance, let them go in peace. The western fleet was all that remained. It withdrew to Rome after Marcellinus was murdered. Some sources blame a Vandal spy for this, but it was probably the work of Ricimer. Ricimer added to the suspicion against himself when he toppled Leo's emperor and, in cahoots with Gaiseric, finally installed Olybrius as the Emperor in the west. After defeating the Romans at Mercurii, Gaiseric sent his Vandals on an all-out rampage against the Leo's eastern Roman Empire, on the grounds that Leo had waged an unjust war against him. He sent ships to the mouth of the Bosporus, where they menaced Constantinople, and sent soldiers to occupy the Greek province of Epirus. Other Vandal squadrons raided Crete, southern Anatolia and even the great port city of Alexandria. Rather than negotiate an end to the war, Leo hired thousands of mercenary soldiers to defend against the Vandal attacks. One of them, the general Tarasicodissa, drove the Vandals from Epirus and was rewarded with the hand of Leo's daughter. Gaiseric remained as undisputed master of the western Mediterranean until his death, ruling from the Strait of Gibraltar all the way to Tripolitania. Leo's death In 474 opened the door for peace. This came late in 475, when Tarasicodissa became the new Emperor Zeno (after defeating the traitorous Basiliscus when he usurped the throne) and sent an envoy to Carthage to negotiate with the now-legendary Vandal king, whom many Romans believed to be invincible. Remarkably, Gaiseric made no severe demands for peace. In return for recognition of his empire and an end to the war, Gaiseric granted full freedom of worship to the Catholics under his rule, agreed to stop pirate attacks on Zeno's realm and returned thousands of prisoners that he and his sons had taken in battle over the years. Note: I used several sources for this article. One is the Wikipedia, utilizing an article on Gaiseric that I wrote myself, but had since been significantly added on to. Another is Brian Adam's excellent account of the history of the Vandals, located at the www.roman-empire.net site. And some of it is from research I did on my own, after the Wikipedia article. 1. The birthdate of Gaiseric is open to some question. He unquestionably died on 25 January 477; for that we have indisputable evidence. However, different sources claim his date of birth in 389, 390, 400 and 406. One source for his death claims he had seen "87 summers" at the time he died. If so, since he did not see the summer of 477, he must have been born in 389. This means he was leading troops into battle in his 60s and 70s, and for that reason, many historians claim the fifth-century dates must be accurate. I don't. If Narses could lead armies in Italy in his 70s against the Goths, Gaiseric could have done the same for the Vandals. It is also worth noting that we know the chronology for his father and brother almost unquestionably. His father Godigisel lived from 359-406, and Gunderic lived from 379-428. Not only does the 389-390 period seem the most congruent, I would also add that between 400 and 406, Godigisel was fighting constant wars and was less likely to be fathering children--and if he did, even less likely to take illegitimate children and raise them as part of his own family. For those reasons, I accept the 389 date as the most likely. 2. I am offering my own interpretation of the supposed meeting of Marcian and Gaiseric here. According to legend, Marcian was brought face-to-face with the Vandal king, who saw a "heavenly vision" behind Marcian that convinced him that the latter would be Roman Emperor someday, and freed him for that reason, while Marcian agreed never to fight the Vandals. Some modern historians totally reject the story. I believe most of it to be true--that Gaiseric would have freed Roman prisoners at this point makes perfect sense, as he was seeking peace. He did the same thing 44 years later when he again sought peace. I doubt he met Gaiseric personally, but I do believe Marcian was freed after offering the pledge not to fight the Vandals--which is why he was willing to fight even Attila as Emperor, but not Gaiseric, who probably never commanded one-tenth as many soldiers in battle. 3. Huneric's reign as king was a disaster. He was incompetent and a bloodthirsty tyrant who murdered several members of his own family, possibly including at least one of his brothers, and allowed the powerful fleet to go to pot. The most capable son of Gaiseric, Gento, died sometime between 469 and 477, while his father was still living. It is possible that Gaiseric changed the rules of succession to prevent a disastrous civil war after his death--many of the Vandals' soldiers were Romans or African mercenaries steeped in the tradition of hereditary succession. These men likely would have followed Huneric, the oldest son of the king, regardless of the Vandals' own rules on kingship. The result would have been a war between Huneric and whoever was elected by the warriors. However, this is just speculation...what we do know is that Gaiseric did change the rules of succession, for whatever reason. Huneric thankfully died in 484, allowing Gento's son Gunthamund (450-496, reigned 484-496) to become King and partially restore the Vandals' position. 4. Gaiseric had no siege instruments capable of breaching the walls of Rome or even of investing them. He would have had to carry the city by frontal assault, which had not been done since Brennus did it in 390 BC. It is safe to say that Rome surrendered mainly because of Gaiseric's fearsome reputation--it is highly unlikely he could have taken the city had Leo not surrendered. 5. Like most modern historians, I have my doubts about the tale that Eudoxia called on Gaiseric for assistance against Petronius Maximus. However, it could be true. Eudoxia certainly had good reason to hate Maximus, who was already a murderer and proved himself a coward as well. And she willingly went to Carthage with Gaiseric, along with her family. In 462, Gaiseric allowed her to leave for Constantinople, where she spent the rest of her life as a respected noblewoman, and died a very old woman sometime around 495. 6. We don't know for certain that Gaiseric did not order the attacks on Greece. However, it is extremely unlikely that he did. Since Hippo, he had followed a strict policy of peace with the Constantinople imperial court, which unlike the western empire still had a formidable military force. Nothing he could have gained from open warfare against the east would have been worth the risk, and Gaiseric almost assuredly knew this. However, after he destroyed their fleet in the ensuing war, it was a different story. 7. The treaty with Odoacer was a mistake that the Vandals paid for much later on. Gaiseric sold Odoacer the rights to almost all of Sicily, retaining only the western tip of the island for himself. The Vandals had never been able to completely subdue Sicily and for that reason, Gaiseric probably saw it as a way to get rid of a trouble spot and get some gold at the same time (Odoacer paid the Vandals an annual subsidy in exchange for Sicily). The deal remained in place under the Ostrogoths, who in 533 allowed the island to be used as a staging area for the Byzantine assault on the Vandal kingdom. By this time, the Vandals no longer had Gaiseric's powerful fleet that allowed them to project their power anywhere in the Mediterranean, which is undoubtedly why Gaiseric saw the deal as no risk to his people's security.